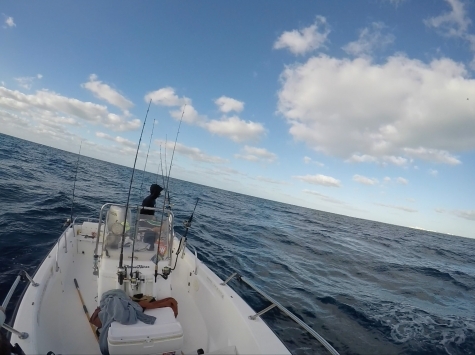 Took the whaler offshore on Saturday to fish the edge. Reports have been pretty slow so I wasnt expecting too much but wanted to go out there and get the kite up anyways and see what would swim under it. The day started as it normally would going offshore. We hit up the local bait guy for a few gogs and threads. Trying to keep things at a minimum cost wise we grabbed a half dozen gogs and half dozen threads for $50. The word was that bait fishing had been pretty good but we wanted to have some insurance just incase. We went to the marker and picked up another dozen and a half threads before heading offshore. I only fly one kite off the 16 whaler and my livewell is only so big so I dont quite have the luxury of going out with a ton of bait. We got what we could fit and head toward the edge. Winds were about 15 kts out of the east and were supposed to lay down in the late morning so I was eager to get out while we had the wind and could keep the kite up. The edge didnt look too great once we got there. Green water and minimal current. I pushed out to about 300ft where I saw speck of a weedline and some birds on it. Water was a little better out there as well. We put the sock out and I figured we would just do a long drift into the shallows and see what depth the fish showed at. "I saw the long kite float with a gog on it start racing to the south fast. I was thinking immediately a sail by the way he took the bait. I fed him for a few seconds, theres no better feeling than having Bullbuster mono roll out under your thumb as you are feeding a fish!" We didnt have any action until we drifted into about 140ft. I saw the long kite float with a gog on it start racing to the south fast. I was thinking immediately a sail by the way he took the bait. I fed him for a few seconds, theres no better feeling than having Bullbuster mono roll out under your thumb as you are feeding a fish! When I came tight a decent sized mahi started jumping. He ended up spitting the hook on a jump right next to the boat. Thats fishin for ya... But right as he did that another mahi picked up a flat line we had out on the other side of the boat. When Kite fishing on the whaler I typically will fish 5 lines. 3 off the kite out of a trident in the back. 1 flatlined spinner going off the bow with a trace of wire to hold the bait in place and either a mid depth or bottom rod out on the other side. When the fish picked up the flat the line began peeling. 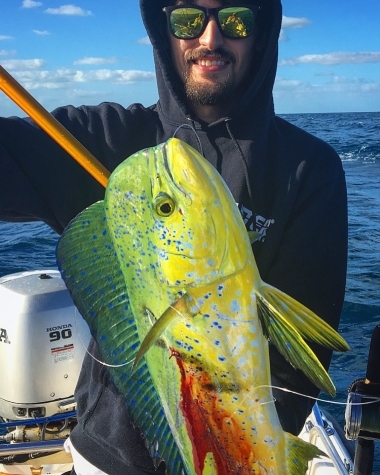 Seeing that he already had eaten the bait for a few seconds before I could get to it, I locked it up and another decent mahi came up jumping. This definitely made us feel better about the one that threw the hook. After a short fight we boated the fish and got the spread ready again. By this time we had drifted into about 110ft. I started to push back offshore. I had heard on the radio some guys talking that they were seeing some better water in about 300ft now and there had been a few tunas caught. On our way pushing offshore I saw a shadow come up on the short. At first I couldn't quite make out what it was. It turned out to be a giant Sunfish! It was really cool to see this thing swim and he came right up to the boat to give us a look. Must have thought we were a funny colored weedpatch! Once we hit about 240 We had another bite on the short kite bait. It was a schoolie mahi. We threw him in the cooler and kept pushing. We had another bite on the mid-depth they never came tight and a few other chops. By 11am the wind had died out so we decided to head on in with fish tacos on the mind. Slow bite was happy with the action we saw. In recent days since the trip I have heard of some better water moving in and current so hopefully things will fire up soon as we come into spring. 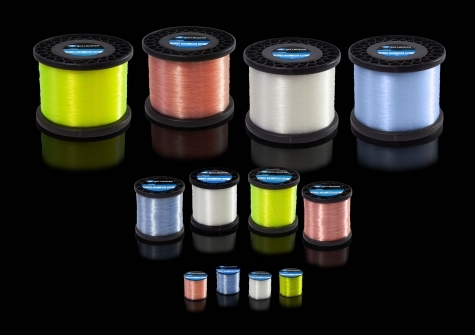 When kitefishing I have my rods spooled with Bullbuster 30lb braid backing connected to a long top shot of 30lb hi-vis mono. At the end of the mono there is a kite ring, float, and a few weights depending on how hard the wind is blowing on top of a bimini twist. For leaders I connect it to the mono with a snap swivel. 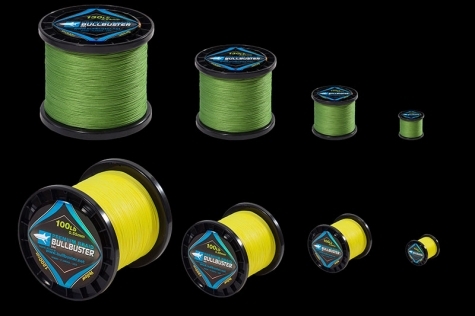 I use about 15 ft of Bullbuster 50lb flourocarbon connected with a loop knot to a 6/0 Circle hook. I go a little heavier on the leader in case that yellowfin comes up one day! Want To Read More About Offshore Fishing? Check out our the resources for offshore fishing by clicking the picture below. 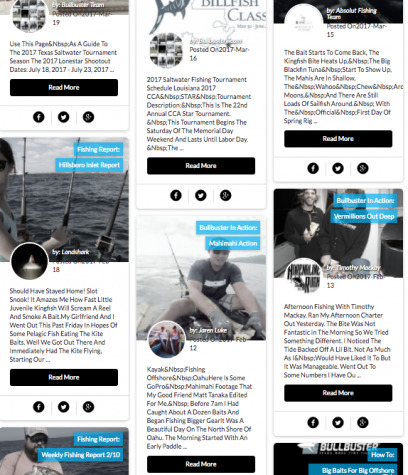 You will find hundreds of articles filled with tips and techniques to make you a better offshore fisherman.